BEN DAVIES felt Exeter City’s match-winner shouldn’t have stood. 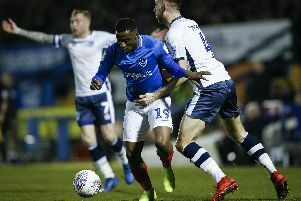 And the Blues’ stand-in skipper believes Pompey didn’t deserve to see their unbeaten start to the season come to a close against the Grecians last night. Paul Cook’s side were undone by a sucker-punch in each half from the visitors as they went down to a 2-1 loss. Pompey fans were incensed Arron Davies’ 56th-minute winner was allowed. There were calls for offside on Lee Holmes, although replays confirmed that was not the case. Davies felt there was a clear foul on Gareth Evans, however, before former Blues loanee Holmes crossed for the goal. He said: ‘We got hit by a sucker-punch and then we got back into the game creating chances. ‘I thought it was a blatant foul on Gaz Evans for the second goal. ‘They’ve played on from that and scored. Davies was flattened to see Pompey lose their nine-game unbeaten run in the league. That meant they failed to break the run of Harry Redknapp’s Division One promotion winners in 2002-03. The loss also sees Cook’s men knocked off top spot and down to third in the League Two table. Davies added: ‘The unbeaten record has gone and that’s disappointing. ‘We’re gutted to lose the unbeaten run at Fratton of all places. ‘We wanted to keep the run going and play well here. ‘We’re gutted. We wanted to stay unbeaten at home.